I was supposed to put this on yesterday. I told one of my followers that I would, and I apologize to catsathebar.org for telling a slight fib. 🙂 I forgot that we had to go to visitation last night and I was busy trying to get some house work done that I have been putting off for to long. It is time for burning pastures, brush and anything else that needs to be burned. We have been seeing smoke on the horizon in all directions. And hearing sirens as the firefighters have been busy keeping uncontrolled burns under control. In Shawnee and Jackson county anyway. 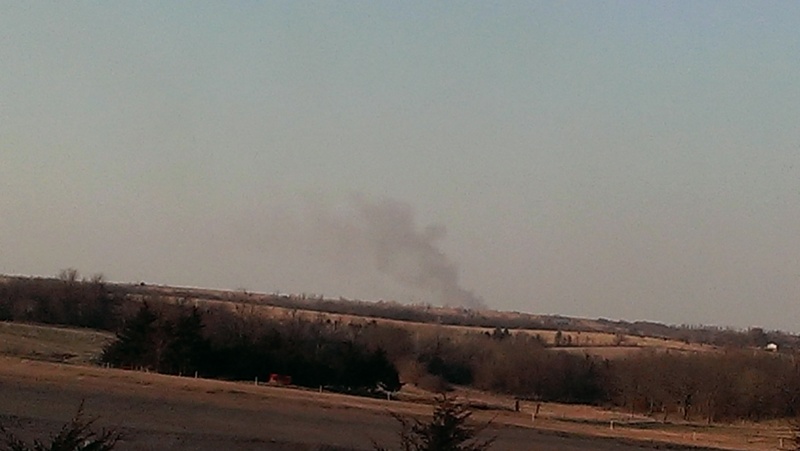 The CRP land to the east of us was getting burned late in the afternoon on March 11. They started with a back fire. This video is of that start to the bigger burn. I don’t know for sure how much acreage is over there, but it is quite a bit I think. I do know that the fence line between there and our house is only about an eighth of a mile. We watched and I took pictures and the videos from our north porch. I hope you can hear the crackle of the fire as it gets going. I could even feel the heat a little bit as I was taking the video. I can’t imagine being any closer. This second video is only about 57 seconds. It was taken a little after dark. The fires burned for quite awhile. I don’t know when they actually died down. I woke up early in the morning about 3 or 4am and they were out. 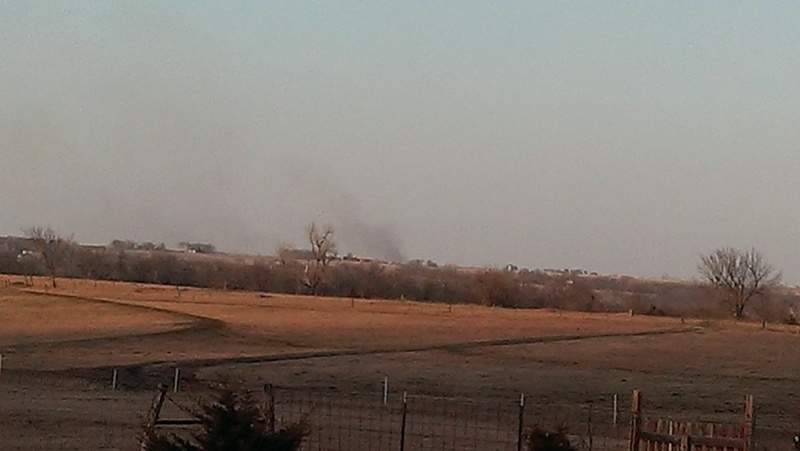 You could still see some smoke drifting up a little here and there. These are some pictures taken before and after dark. Okay I am having trouble getting more pictures on. Apparently since I am putting videos on I am running out of me space. I either have to finally go to a premium plan or just delete some shots from my library. Guess if I am to continue blogging, I will have to eventually go to a premium plan anyway. We’ll see. I will get back to the pictures soon I hope. I can understand your uneasiness. We hear a lot about these fires on the news. All I can do is send prayers for relief, rain and whatever else is needed at those times. It does make me nervous, especially when they burn so close to the nighttime hours. They did a good job on setting the back fires first. As a California girl, this sends a chill down my spine. We’ve had so many out of control fires in our area. The word ‘control’ burn is really a misnomer. The Forest Service pretty much lights the fire and runs back to the dozers with the tankers already revving up. Needless to say, we do ‘control’ burns every thirty years. This would scare the bejeezus out of everyone. Oh! Almost forgot. The quality was excellent by the way. Lol. I did hear the crackling, as a matter of fact. It was fun to watch. It brought back memories of my childhood on the farm, burning the fields. I ‘liked’ earlier but only now got to get back to watch the videos completely. (Oh no need to apologize, I miss doing stuff all the time) But what you DO have to apologize for is not putting any narrative on the videos! I I was looking forward to your sultry voice, with that accent, (what would you call it anyway) doing a descriptive narrative of the burn. Oh me too! It makes me very nervous that close to the house but at the same time it is fascinating and beautiful. I hope to get the rest of the pictures on soon. Amazing videos! I understand the reasoning for a controlled burn, but a fire of any kind, burning in the open, puts me at unease.